Earlier today, a dear buddy of mine (hi Jack) sent me a blog that I’d already been sent a handful of times over the past few days. 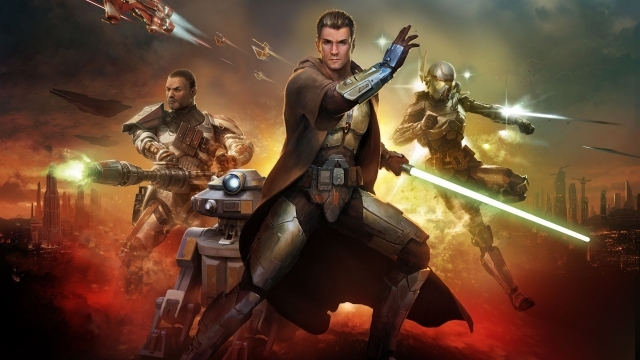 This blog, which shares the same featured image up above (no free ads) claims that they’re “hearing” that Disney is planning to release a Knights of the Old Republic TV series for their new streaming service, Disney Plus. Now, at the bottom of pretty much any speculative blog worth it’s salt, there’s usually a link to a source. At the bottom of this blog, the source is hyperlinked to the Patreon for someone named Daniel Richtman, who styles himself as a “Twitter influencer and writer” in his own Twitter bio, and a story and scoop freelancer for SuperBroMovies in his Patreon bio. His Twitter avi is a shark with a laser on its head, so you know this guy clearly knows his stuff. Daniel also claims to have “insider knowledge, which needs funding”, which essentially boils down to “pay me to fuel my semi-educated guesses and rumormongering” if you ask me. My best guess is that the original blog in question here actually spurred from a post on /r/StarWarsLeaks (filed appropriately under “wild rumor”) that also cites Mr. Richtman’s Patreon post as a primary source. STAR WARS SCOOP: So my Disney insider just told me they got another survey asking them if they’ll want to see “movies/shows based on Legends books/games with examples being Thrown, Old Republic, Darth Bane”. That’s. About. It. A Patreon post wildly paraphrased into a Subreddit that was then parlayed into a click-baity blog, which eventually made its way into my text inbox, Facebook feed, and Twitter timeline. Sigh. Sorry to burst your bubble, folks – but I’m gonna err on the side of this being a total shot in the dark rather than an actual credible rumor unless I see something else to back it up. A man can dream though, can’t he?